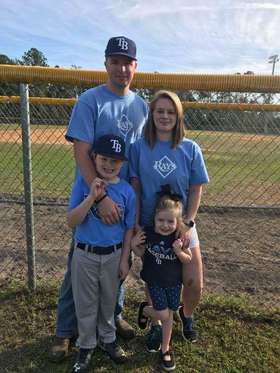 Congratulations to Maegan Bowen of Yulee Little League for being selected Little League Mom of the Year by Little League International. She is shown here with husband Justin, daughter Alta and son Brantley. TOURNAMENT BRACKETS NOW AVAILABLE ON MYSALL.ORG - SHOULD BE UPDATED SHORTLY AS THE ETEAMZ WEBSITE IS HAVING TECHNICAL ISSUES. 2018 SECTION TOURNAMENT DATES AND LOCATIONS CAN BE FOUND ON THE HANDOUTS PAGE. Arlington LL, Baker Co. LL, Callahan LL, Elm Street LL, Highland LL, Hilliard LL, N.O.L. LL, San Mateo LL, St. Augustine LL, and Yulee LL.